I've gotten a lot of questions about my produce delivery lately...So I thought I would dedicate a post to this service. Boston Organics is an organic produce delivery service, serving the greater Boston Area. (http://www.bostonorganics.com/). Since I live alone, and only cook for the boyfriend a couple times a week, I usually only receive deliveries every other week. Its pretty simple to do this...I use the veggies that go bad quickly (lettuce, herbs) and save the heartier things (squashes, collard greens) for later in the week. If it looks as though something is going to go bad sooner than anticipated, I'll just cook it up and freeze it. Munch of Meet and Eat (http://www.meetandeatonline.com/) inquired a bit, and noticed that it does not look like I have any say in what comes in my produce delivery....I do have a little bit of say, but it is limited by what the company is able to get their hands on! It also often reflects what is in-season at the time. Let me clear this up with some of the specifics! There are several levels of commitment - you can get deliveries every week or every other week. And there are 3 price ranges. You can also determine the ratio of fruits to vegetables. You can get all of one or the other, 1/2, 2/3's ... whatever works for you. I started with the $29 1/2 fruit/1/2 veggie option. After a few weeks of not eating all of my oranges, and having to buy broccoli mid week, I decided to heavy up on the veggies. Boston Organics also gives the option of a 'NO' list. So folks with allergies, sensitivities, or a hatred for all mushrooms (not me) can let the good people at Boston O. know, and they can replace something else for the offending fruit/veggie. As a side note, I almost never eat salad that I make myself. It is rare that I crave one...so instead, I substitute any greens (kale, collards) for lettuce. There is also the option to 'add on' other locally produced organic items such as bread, coffee, cheeses and honey.....For my last order I added on some green onion cheddar, some local (not organic, but who cares when its that fresh!) honey, as well as strawberries and ginger. Per the strawbs and ging...you can also add on produce items that aren't in enough abundance to include in the boxes....Let me tell you those strawberries were worth every penny. They have recently rolled out a new option as well, called the 'Dogma' box. This is sourced as close to Boston as absolutely possible. The variety seems a little less, and there are no substitutions. But I suppose that if you love squash, and good environmental Karma this is the one for you. Here is a picture of my delivery yesterday....it's a bit blurry - sorry! I already ate the asparagus with dinner last night...I'll post that tomorrow with the mussels. All in all, I've been really happy with the deliveries. The produce is always VERY fresh and is as good if not better than what I could pick on my own from the market...the price is pretty reasonable for a fridge full of organic produce. I've been much better about getting a lot of veggies in my diet, and the range of produce means that I often get a veggie or a fruit that I have never prepared before and would likely never choose on my own. For a food lover like me, opening that box every other Tuesday is like a bi-monthly Christmas. If you are in the Boston area I whole-heartedly recommend Boston Organics for both quality and service. If you are outside the Boston area, look for similar options in your area, or frequent your local farmers markets. Oftentimes, local farms operate with organic/sustainable farming, but cannot afford to get certified. Companies like this one, and local farmers, clearly love and respect their food enough to give their customers the very best. Plus, its always nice to know who is producing your food. Support your local economy, your local farmers, and the environment by choosing local (or local and organic) whenever possible. Please let me know if you have any other questions, I would love to answer anyway I can. You're on fire. 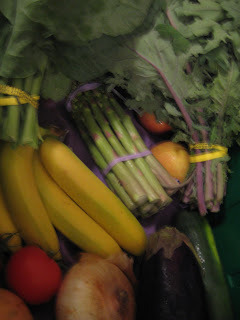 Still haven't ordered from Boston Organics, but plan to do so! So it's like Fresh Direct but with good morals! Thanks for elaborating, I've been so curious about it. I start my CSA next week so surprise vegetables will become part of my life as well. And hooray for the soapbox. Since you actually have readers, it's great to let 'em know the philosophies behind your cooking. Thanks Alicia! Sold! You just inspired me to look up a Chicago based one to sign me and Robby up for it!